Lauren Clem kicks the ball. The senior goalkeeper will lead the Wildcats into two home matches against No. 13 Rutgers and Maryland. On the field and in the record books, senior goalkeeper Lauren Clem rarely looks up to anyone. 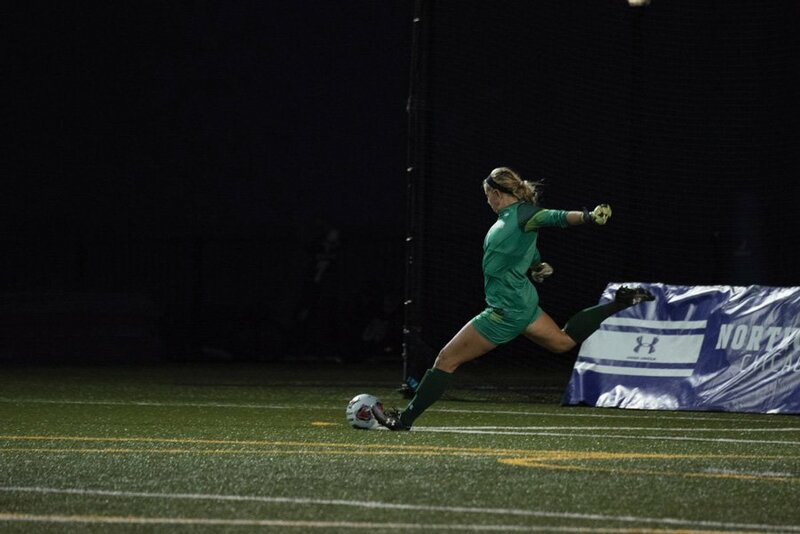 She is Northwestern’s tallest player and recently moved into second place on the Wildcats’ all-time saves list. In NU’s game Friday against No. 13 Rutgers (7-0-1, 1-0 Big Ten), Clem will face off against a goalkeeper at her level. Clem and Scarlet Knights goalkeeper Casey Murphy are two of four shot stoppers on the 2017 MAC Hermann Trophy watch list, given to the nation’s most outstanding player at the end of each season. While Clem led the Cats (4-4-1, 1-1) to a Big Ten Championship in 2016 and earned third-team All-America recognition, Murphy was competing overseas, leading the U.S. National Team to a fourth-place finish in the FIFA U-20 World Cup. At 6-foot-1, Murphy is the tallest goalkeeper to play in a world cup match for the U.S. Despite missing all of last season, Murphy has been statistically the most successful goalkeeper so far in 2017. She has not allowed a goal all season and was just named National Player of the Week. The Scarlet Knights gave NU its only Big Ten loss in the 2016 regular season. The Cats expect a defensive battle Friday night at Martin Stadium against an opponent that junior forward Brenna Lovera considers a major rival. While NU scrapped to a .500 nonconference record, No. 12 Rutgers is undefeated this year. They are outscoring their opponents 22-0 and are one of only two teams in the country who has not allowed a goal in 2017. The Cats are coming off a 1-0 victory against Ohio State on Sunday, a win that coach Michael Moynihan said reminded him of last season’s dominant defensive efforts. NU’s game against Rutgers will be followed by another home match Sunday against Maryland (6-1-1, 0-1). Though the Terrapins have only one loss on the season — they fell to the Scarlet Knights last week — the Cats are not looking ahead. Lovera said their primary focus in practice this week was developing offensive strategies to get the ball past Murphy.